姜力铭, 宋戈, 夏商, 陈旭. 转化生长因子β1对人牙髓干细胞成纤维向分化的作用[J]. 中国医科大学学报, 2018, 47(5): 398-401, 405. JIANG Liming, SONG Ge, XIA Shang, CHEN Xu. 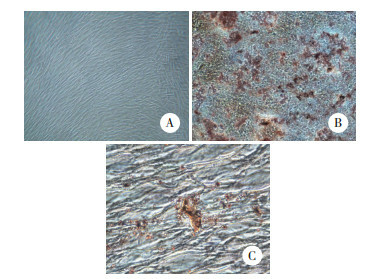 Effects of Transforming Growth Factor-β1 on the Fibrogenic Differentiation of Human Dental Pulp Stem Cells[J]. Journal of China Medical University, 2018, 47(5): 398-401, 405. Abstract: Objective To investigate the effects of transforming growth factor beta 1(TGF-β1) on promoting the fibrogenic differentiation of human dental pulp stem cells(hDPSCs). 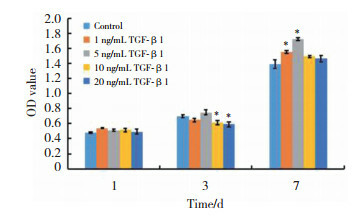 Methods The cells were treated with different concentrations of TGF-β1(1, 5, 10, and 20 ng/mL) and cell proliferation were examined after 1, 3, and 7 days. The expression of fibrogenic-related factors(Collagen I, Fibronectin, Periostin, and α-SMA) was examined by RT-PCR at 7 and 14 days. Results MTT data showed that 1 and 5 ng/mL of TGF-β1 could promote the proliferation of hDPSCs at 7 days. RT-PCR results showed that under 1, 5, and 10 ng/mL TGF-β1 treatment, the Collagen I expression was 8.2, 9.3, and 8.1 times and the α-SMA expression was 6.2, 6.7, and 5.8 times higher than that of the control group at 7 days. Periostin expression levels in the 5 and 10 ng/mL TGF-β1 groups were similar and about 3.2 and 1.8 times the expression levels of the 1 and 20 ng/mL groups, respectively(P < 0.05). At 14 days, the expression levels of the fibrogenic-related factors in the experimental group decreased but were still higher than those of the control group. Conclusion TGF-β1 can promote the fibrogenic differentiation of hDPSCs with the 10 ng/mL treatment being the most effective. ZHANG F, REN T, WU J, et al. Small concentrations of TGF-β1 promote proliferation of bone marrow-derived mesenchymal stem cells via activation of Wnt/β-catenin pathway[J]. Indian J Exp Biol, 2015, 53(8): 508-513.